About Us - Website of Horse Connections! 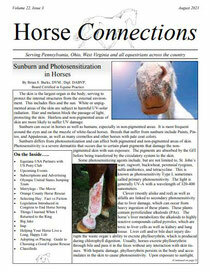 We started as a four-page black and white monthly publication in June 2000 distributed in the tri-state area (western Pennsylvania, northern West Virginia and eastern Ohio) and have now grown to a multi-page, full-color digital publication that is accessible to even more horse lovers in any location, at any time, on any type of device that is connected to the Internet. Horse Connections is the on-line destination for all horse and pony lovers of any discipline - hunters, jumpers, western, dressage, eventing, gaming, fox hunting and more; and any breed - Thoroughbreds, Quarter horses, Warmbloods, Appaloosas, Shetlands and many more; where they can find useful information. Riders of every ability level, beginner through advanced, and owners of one or a hundred horses will find interesting articles in every issue. Horse Connections is for any and every member of the horse world. Advertisers can now do full-color ads at a black-and-white price and reach even more people than ever before. Links to their websites and e-mail addresses can be added at no additional cost. Shows and events that are listed on the Upcoming Events page can also have their links included. As it has always been, Horse Connections will continue to be a free publication. It is a great way to keep in touch with all that is going on in the horse community and a great way to get your “word” out to the people who will use it the most. This website is also a resource guide of services, barns, trainers, everything horse related in the regional area. Tell us how we are doing. Let us know what you would like to see in the magazine. We’d love to hear from you! Contact us any time right here. Don’t forget to sign up to be one of the first each month to receive the newest edition of the magazine in your e-mail inbox. Check out the new, improved digital Horse Connections!